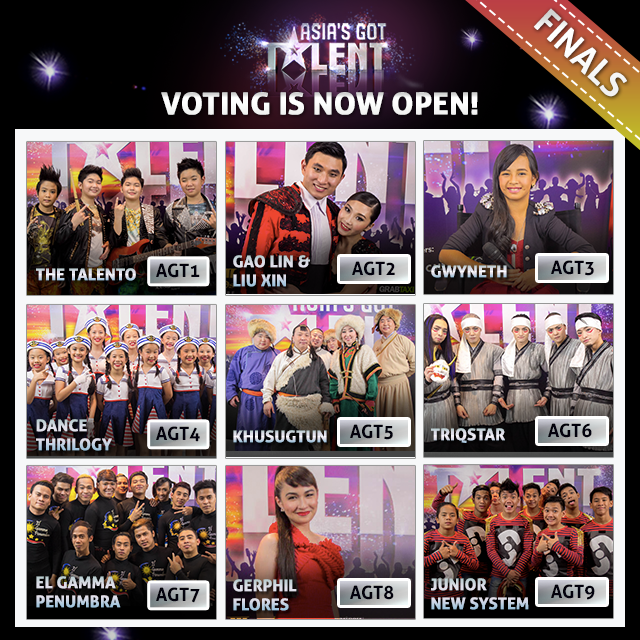 It's the Asia's Got Talent grand finals! I didn't want to miss it, even the replay, and YouTube video uploads later. But a lot of acts were a miss though. Good thing there were also numerous acts who hit the bulls eye. First of all, how did Talento and Dance Trilogy made it to the grand finals? I feel bad for Sada Borneo and Time Machine as I would have chosen them instead, but that's just me and obviously not the sentiment of the general voting public. These kid groups are cute though but they're a miss for me. Thailand and Singapore (home court advantage) would certainly support them for sure though. Several acts up the ante from the auditions to the semi-finals and now the grand finals. These acts certainly hit the mark by improving every time: Gerphil Flores, Triqstar, Khusugtun, and El Gamma Penumbra. Although there is no text voting in Japan, I hope Triqstar gets Facebook voting support from their fellow Japanese because they are weirdly hypnotizing! As for Khusugtun and their mesmerizing traditional music, I think Mongolia and nearby countries (Kyrgyztan, Kazakhstan, the far east Russia, and more) has their back. Filipinos will have a hard time choosing which act to support though. El Gamma Penumbra's inspiring shadow play is a winner for me while Gerphil Flores really made the Impossible Dream possible. I do hope David Foster does help her music career. Gao Lin and Liu Xin are still a hit specially with that proposal although their semi-finals performance was better. I guess the guy's back injury took it's toll because he was holding back on some routines. The same applies to Junior New System who I believe performed better during the semis. The stage's lighting system was still bad though. Plus, waving the Philippine flag was an overkill. Triqstar incorporated Japanese culture and so did Khusugtun for Mongolia without having to shove their national background to our throats. Lastly, Gwyneth Dorado is also a hit tonight and made a comeback after that lackluster semi-final performance. Titanium was a perfect song choice for her. David is a hit too. All his comments were positive or maybe all acts really performed well for the grand finals tonight. So who will you vote? I wish I could vote for as many as I can but I can only choose one on Facebook. My husband and daughter voted for different acts. I still have a few days (Monday 12 AM Singapore time) to think about loading a prepaid for SMS voting. So do you.